Fast growing women’s network Glam Media is now a fast growing women’s and men’s network with the launch of a sister (err, brother) site Brash.com later this week. Update: Brash moved up its launch to today. The site will target 18-49 year old men and will, like Glam, bring in content from a network of third party sites. Glam will focus its efforts on ad sales and gathering content partners. Screen shots of Brash are below. 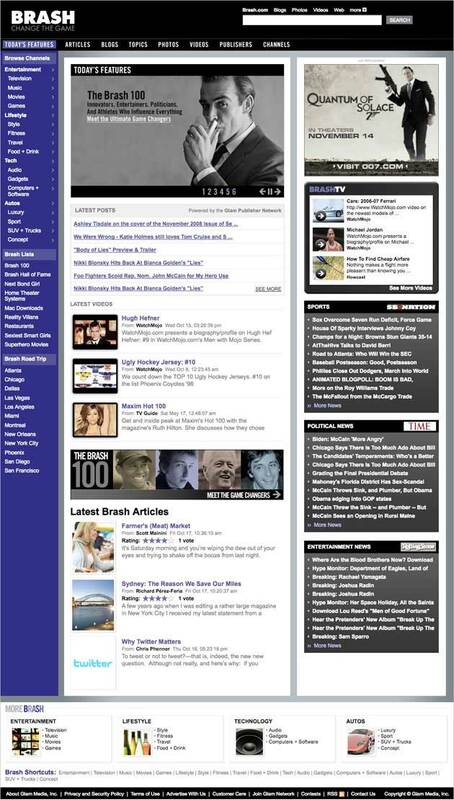 More than 25 content sites have joined the Brash.com Network at launch, including: ArtistDirect; DigitalTrends.com; eCoustics.com; InGameNowSeriousWheels.com; Squidoo and MonstersandCritics.com. Content will also be syndicated from Time.com for national news; Rolling Stone for music news and updates; TheCarConnection.com for car reviews and news, SB Nation for sports coverage and CNET for technology information. Launch advertisers include Unilever’s Axe brand deodorant, H&M and HP. The new James Bond Movie “Quantum of Solace” is one of the top new advertisers on Brash as well. Glam says that the aggregated Comscore user numbers from the original content partners is over 10 million/month. Glam is growing at a health clip as well. Recent Comscore stats say 52 million unique users visited Glam Media sites in September from the U.S., and more than 90 million worldwide.